THE Gates Foundation is a very megalomaniac organisation. It is Gates’ ego and money-harvesting operation. It is tax exempt because it masquerades as a charity while the reality of the matter is, as reiterated by this report about Cascade Investment LLC, the primary goal is profit, not giving. The article from The Wall Street Journal (owned by a friendly billionaire) and other Wall Street press tries to trivialise it like “The arrangement is simple: Mr. Larson makes money, and Mr. Gates gives it away.” Giving it away to whom? Putting the PR offensives aside (health-washing and education-washing), consider articles like this new one titled “Bill Gates Donates $5.6 Million to Cornell: University that Helped Monsanto Promote GMO rBST”. Unsurprisingly, Bill Gates is a big investor in Monsanto. What a coincidence. Science, charity, education — surely! Or maybe just self interest, greed, and ultimately profit? In the media, which a lot of the time gets bribed by Gates (he spends around $300 million per year paying media companies), Gates is portrayed as one who supports poor students, poor academics in need of funding, and the solution to world hunger, disease, etc. It could not be further from the truth if one actually looks what he invests in (for profit). It’s a diversion tactic, tactfully implemented and maintained. “In the media, which a lot of the time gets bribed by Gates (he spends around $300 million per year paying media companies), Gates is portrayed as one who supports poor students, poor academics in need of funding, and the solution to world hunger, disease, etc.”Bill Gates paid The Guardian a lot of money for sponsorship, puff pieces, fake endorsements (at the top of thousands of article), and for silence (i.e. no criticism) on Gates investments. “Comment is free”, a section of this paper that Gates controls only to a lesser degree (he has already bribed it for silence and grooming, but silencing contributors is a tougher challenge), published the other day an article title “Why the Big History project funded by Bill Gates is alarming”. The article is summarised as follows: “As UK state schools increasingly follow the US model, someone with no background in education could disrupt the learning of thousands of children” (“Big History” is similar to “Common Core” in the buzzword sense. A lot of it started in the paper/journal of record which Gates likes to visit to push his agenda). Remember what Gates does to occupy the education system (currently through “Common Core”) and what he has done to capture British schools as well (indoctrination), not just British policing. An article by Valerie Strauss, a longtime critic of Gates, was published in a competing journal of record (from which the Gates family got kicked out after misconduct). It is an article titled “Bill Gates wants your kids to learn history this way — and he’s paying to get it into schools”. It’s about the same issue. It’s worth reading. The bottom line is simple. Be aware that a lot of the press gets paid by Bill and Melinda to praise them. It’s not a donation but a request with strings attached to money. It all helps distract from other evil business practices that Mr. Gates uses to make himself even richer (while pretending to be giving away money). Thankfully, a lot more people have become aware of this in recent years. Gates’ information warfare is not working quite as he once hoped. It is especially hard to bamboozle educators by preying on ignorance. Teachers have become some of his most vocal critics and they are thirsty for knowledge about Gates’ real motivations, which have nothing to do with human welfare; it’s about corporate welfare of companies that Gates invests in. Microsoft is not a company that cares about security. It seems to care about the security state (i.e. surveillance), which is why it makes its products so easy to infiltrate (by the “Good Guys”). As we showed before, Microsoft’s layoffs focus in part on security-related staff, or staff that’s associated with security state type of stuff (restricting operation of computers, back doors, etc.). In a statement sent to Channelnomics sister-site CRN UK, Microsoft said the staff reductions in the latest round have been “spread across many business units and many different countries”, but did not go into specifics as to where it is swinging the ax. “Trustworthy Computing group” is one of the affected units, based on Seattle-based press. Reportedly, according to this press (heavily biased in Microsoft’s favour), the group was “folding into other units”. It’s a clever and rather classic way to disguise layoffs (like the term “reorg”). “A spokesman confirmed that an unspecified number of jobs are being eliminated from the Trustworthy Computing group as part of the changes,” said the report that we cited last week. So by “folding into other units” he basically meant “layoffs”. irresponsible and suicidal. The company’s name is now tarnished. Increasingly here in the UK I see businesses that move to Free software and GNU/Linux, usually for security reasons, not just cost savings (the migration itself can be pricey). Some months ago staff at Ryman (a large UK chain) told me that they had moved from Windows to Ubuntu GNU/Linux due to virus infections. Former information technology employees at Home Depot claim that the retailer’s management had been warned for years that its retail systems were vulnerable to attack, according to a report by the New York Times. Resistance to advice on fixing systems reportedly led several members of Home Depot’s computer security team to quit, and one who remained warned friends to use cash when shopping at the retailer’s stores. THIS is our third (hopefully among many) outline of EPO abuses. It’s the third instalment in a multi-part series about the European Patent Organisation/Office, which is rotten to its core. EPO — like Google — has enjoyed positive public perception for too long. It’s time to shatter the myths of professionalism and innovation. Having studied dozens of documents and articles about this topic (usually translations because the English-speaking press mostly overlooks these issues), we are shocked to see just to what extent the EPO engages in dirty tactics, conflicts of interest, and revolving doors. It’s no better than the FCC or CAFC. 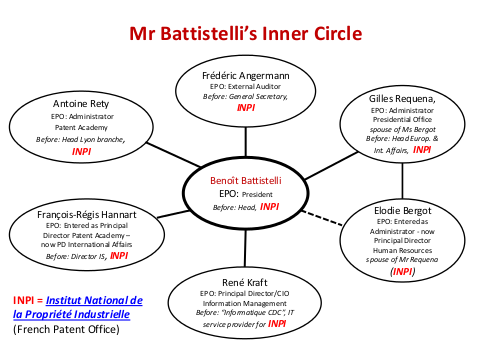 Today’s article focuses on Battistelli, the EPO’s President. As we keep getting sent more dirt about the EPO it is hard to say just how many future articles will revolve around his own scandals, which are unique because they show how abuses can go all the way up to the top (EPO President is the highest position). One person told us on Diaspora that “Richard Stallman has said that the EPO is corrupt a few times, before this man [Topić] was put in charge. “Thanks for bring up the issue. “It seems to be the fault of the European Commission,” he added, citing this as an example. Quoting Stallman: “The EU administrators said they would let each country decide whether to allow genetically modified crops, but the proposed implementation is a trap. It has legal flaws, so these one-country bans might then be overturned. “He wrote a lot about the EC’s nasty trick at the time,” said the person about Stallman. We too covered it for years, in video form also. The EPO derives its power from an administration which in its own right is relatively immature (like the Union) and ripe for abuse. So let’s take a look at what Battistelli is not so well known for. “Here is a link to an interview with Mr. Paul Ernst,” said our source, “who was a member of the (now abolished) EPO Audit Committee. The dissolution of the Audit Committee at EPO was justified with the argument that the Audit Committee’s tasks are already carried out by Internal Audit and the Board of Auditors (BOA). What is your view on this? Paul Ernst: The reasoning behind the decision reveals a lamentable ignorance of the fundamental role of an Audit Committee. The Audit Committee reports directly to the Administrative Council, whereas Internal Audit reports to the President and has no right to address the Administrative Council directly. The Audit Committee protects the independence of both audit functions and observes the coordination between Internal Audit and External Audit, and the follow-up given to audit recommendations. The Audit Committee should also raise its voice if a significant conflict of interest is discovered, e.g. a close relationship between a member of the BOA or the Internal Auditor or the Chair of the governing body and the chief executive. There is no other institution that plays a similar role. These are significant differences that demonstrate that the Audit Committee does not duplicate the work of the Internal Auditor nor the Board of Auditors. “This is precisely the situation that exists between Battistelli (chief executive) and Angermann (member of the BOA),” explains our source. “However, as there is no longer any independent Audit Committee, it cannot raise its voice in the matter … how convenient for Battistelli. To quote: “En supprimant de facto l’indépendance de l’audit externe des comptes (budget de l’organisation 2 000 M€) la transparence sur les évolutions de l’OEB ne sera plus de mise. Et ceci sera aggravé par l’absence de contrôle interne crédible lié à l’évolution des relations internes à l’institution” (full text of the letter is available in French). Full details of this were made available to us in the form of copies of the Administrative Council documents referred to above (for readers’ information and for future reference). “These documents are not classified as confidential so in principle they can be made publicly available,” explained our source. Notice the trend based on the chronology. Audit no more!